Posted in: 1 Pageant Pages, 2 Shout-out-Looks. 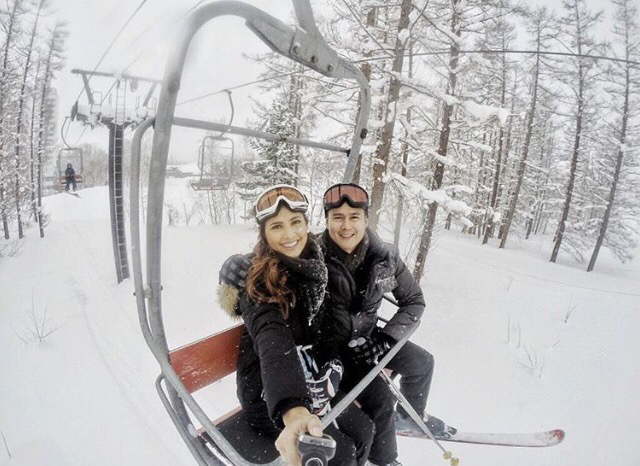 Tagged: Hillarie Parungao, Hokkaido, Miss World 2015, Niseko. A few days ago, Miss World Philippines 2015 and Miss World 2015 Top 10 Finisher Hillarie Danielle Parungao packed her luggages and flew to Japan for a well-deserved vacation in the Land of the Rising Sun. Accompanied by her special someone Mike, they headed straight to a less-touristy part of the country – the frozen and white city of Hokkaido. So instead of surrounding themselves with bullet trains, sightseeing travelers and the busy crowds at Shibuya and Shinagawa, they opted for the snowy hills and landscape of Niseko Annupuri Ski Village where thick fur coats, skiing and -4 degrees were the orders of every single day. Actually, our beauty queen is no stranger to snow skiing, having learned how to navigate the slopes and downslides in previous trips. This wandering break is just what she needed after the demanding schedule and preparations she went through during Miss World in Sanya, China.